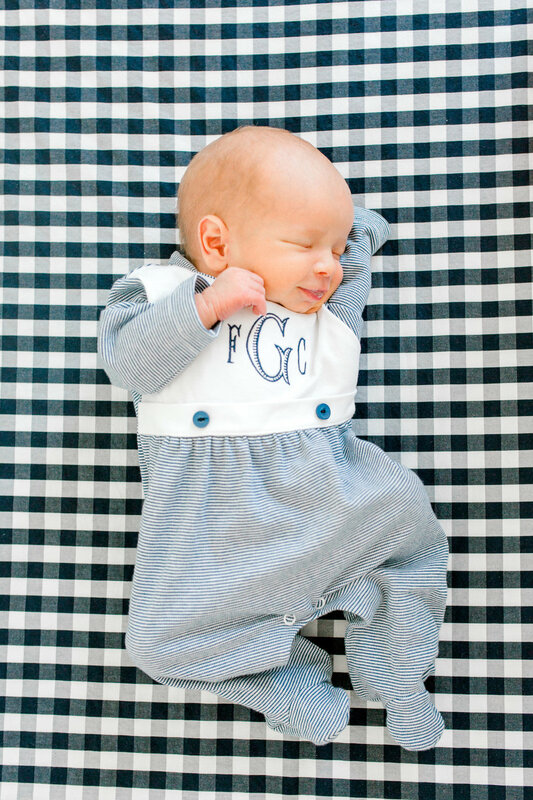 Baby boy clothing was something that intimidated me from the moment we found out our little bug was a boy. I grew up with sisters in a world of stealing shirts and mascara. I had no clue what to do with a tiny little human that would roll around in the mud and play with worms (ohhhh god). Adam and I both like quality clothing, so it was tough for me to not spend ALL of the money on baby clothes for Fritz. The issue with buying clothes for a baby: they need a new wardrobe every three-ish months. There are certain special occasions that call for a special outfit but for everyday wear, it just doesn't need to cost a fortune. This is what works for us and our family! No judgment if you spend $100 on an outfit or $1. Personally, I think we dress Fritz pretty darn cute and not at the expense of his college fund. Above is a typical Fritz outfit: Old Navy Pants, Granamals T-Shirt, Little Unicorn Bib and Freshly Picked moccasins! Old Navy: I go here for easy separates like a chambray shirt, striped drop crotch pants and onesies. Everything is usually under $10 and that makes me happy and I'm not gutted if it gets ruined or he outgrows it super quickly. However, everything alway goes on sale and quickly - so what to buy what you until its majorly discounted! Gap: We have a bunch of summer outfits from here all in 3-6 month. I will say Baby Gap runs B I G. But Fritz is almost able to fit into a 6-12. They are having a great sale right now where nearly everything is 50% + and extra 20%. I ordered him two little pairs of camo joggers and some long sleeve henly onesies. Again, nothing really over $10-$20 here. Last summer I shopped their sale rack for 6-12 month fall sweaters which will be perfect for the next few months! H & M: I just picked him up some sweatshirts and pants for fall. He is growing out of his 3-6 month summer clothes at a rapid rate. H & M does tend to run a little weird their 4-6 month clothes were small and their 6-9 month clothes were H U G E. I also really think you need to see their stuff in person. The quality varies. Burt's Bees: Love their shortalls for daycare. Very affordable and wash really well. Bonus: Amazon Prime. TJ MAXX: Our TJ MAXX is like a baby heaven. They have Aiden and Anais, Little Unicorn, Vineyard Vines - - - all of the things for like $7.99 a pop. So, when I have time to dig, I go there! I have a feeling he will reject my preppy/hipster baby vibes sooner than later and demand to wear all Under Armor and Nike and in that case, its coming from TJ MAXX as well. Zara: Usually I have such a hard time ordering online for Fritz from Zara, but placed an order this morning and am thrilled with what I got! Some cute henleys, pocket t-shirts, harem pants and the prices were amazing. Here is a small clip of my order. Florence Eiseman: This is a Milwaukee based brand that I wore when I was a baby, as did my two sisters, but its incredibly expensive. My mom picked up Fritz a bunch of pieces and while they aren't his everyday style, he looks so cute in them! I can't wait to see him in these for Christmas with a little white oxford. *Yes, Fritz has velvet Christmas overalls. Beaufort Bonnet Company: Again, these are special occasion outfits. We do not need to spend $60+ on a Jon Jon for him to spit up on all day. That being said, his Gigi did think he needed a special one for the Fourth of July in San Diego and the quality is really lovely. SK Creations: I LOVE their stuff. The most incredible monogramming and the softest fabric. If you check out the Etsy store, you might recognize a little model on there! SK Creations made Fritz's coming home outfit and another shortall that he lived in this summer. These are more than I usually spend on everyday outfits, but $20 for a MONOGRAMMED romper is priced so well!